Picture a treasure chest. Not a small box that might hold jewelry on a girl’s nightstand — a large treasure chest, larger than any suitcase you own, larger than any suitcase you’ve ever seen. Picture a massive oak treasure chest, like pirates might have used, with large iron hinges and a huge clasp. The size and age and strength of this strongbox say it was made for the most valuable things. Inside this chest are all of the things you wish could somehow be restored to you. Everything you have lost, everything you know you will lose. Is There a Hope That Really Overcomes All This? Can we just be honest? Life is brutal. There is just enough goodness to rouse our hearts with expectation, and plenty enough sadness to cut us back down. When the cutting down exceeds the rising up, you wonder if you shouldn’t just stay down. “I wept when I was borne,” wrote the Anglican poet George Herbert, “and every day shewes why.”1 Yes, life can also be beautiful. I am a lover of all the beautiful things in life. But may I point out that the movie by that name — Life Is Beautiful — takes place in a Nazi concentration camp. The story is precious in the way the father loves and protects his little boy from the ghoulish realities all around. But the father is killed at the end. Many, many people die horrible deaths at the end. We need more than a silver-lining outlook on life. Much, much more. We need an unbreakable, unquenchable hope (All Things New, pages 3–4). » What is an example of a situation where you are currently losing hope? » What is the hardest aspect of holding on to hope in every situation? Three things will last forever—faith, hope, and love (1 Corinthians 13:13 nlt). By saying they last forever, God names these three as immortal powers. A life without faith has no meaning; a life without love isn’t worth living; a life without hope is a dark cavern from which you cannot escape. These things aren’t simply “virtues.” Faith, hope, and love are mighty forces meant to carry your life forward, upward; they are your wings and the strength to use them. I believe hope plays the critical role. You’ll find it pretty hard to love when you’ve lost hope; hopelessness collapses into who cares? And what does it matter that we have faith if we have no hope? Faith is just a rigid doctrine with nothing to look forward to. Hope is the wind in your sails, the spring in your step. Hope is so essential to your being that Scripture calls it “an anchor for the soul” (Hebrews 6:19). 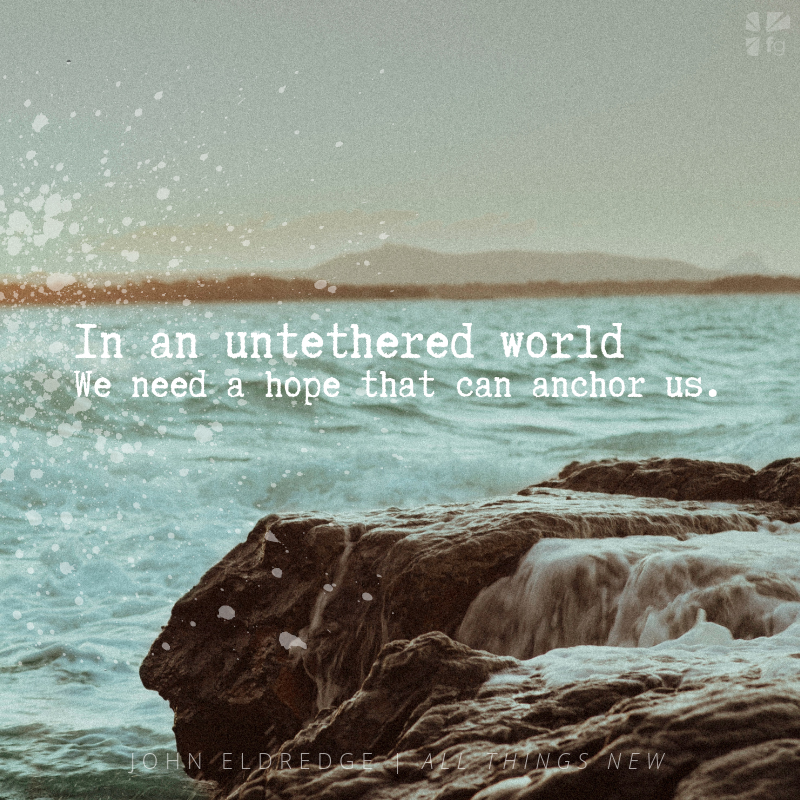 In an untethered world, we need a hope that can anchor us (All Things New, page 8). » It might be helpful here to pause and ask a few questions. What would you say is the great hope of your life these days? » How do you see the mighty forces of faith, hope, and love (see 1 Corinthians 13:13) working together? » Do you agree that hope plays the critical role? Why or why not? At the renewal of all things?! God’s intention for us is the renewal of all things? This is what the Son of God said; that is how He plainly described it. I can hardly speak. Really? The Greek word used here for “renewal” is palingenesia, which is derived from two root words: paling, meaning “again,” and genesia, meaning “beginning,” which of course hearkens back to Genesis. Genesis again. Eden restored. Could it possibly be (All Things New, pages 12–13)? » In this passage from Matthew, what do you think Jesus means when He says those who have left houses or relatives or fields for His sake will “receive a hundred times as much”? Describe what a hundred-fold increase in each of these three categories might look like. » Have you ever heard of the Greek word palingenesia before? How does the definition of that word — “Genesis again” — change your interpretation of what Jesus meant by the phrase “the renewal of all things”? The thing you are made for is the renewal of all things. God has given you a heart for His Kingdom — not the wispy vagaries of a cloudy heaven, but the sharp reality of the world made new. This is one of the most important things you can know about yourself. Did you know this about yourself? When was the last time you told yourself, as you looked in the mirror in the morning, Good morning; you have a heart for the Kingdom. This explains so much; it will be such an enormous help to you. It explains your anger and all of your addictions. It explains your cry for justice, and it also explains the growing hopelessness, resignation, cynicism, and defeat. If we will listen with kindness and compassion to our own souls, we will hear the echoes of a hope so precious we can barely put words to it, a wild hope we can hardly bear to embrace. God put it there. He also breathed the corresponding promise into the earth; it is the whisper that keeps coming to us in moments of golden goodness. But of course. The secret to your unhappiness and the answer to the agony of the earth are one and the same — we are longing for the kingdom of God. We are aching for the restoration of all things. That is the only hope strong enough, brilliant enough, glorious enough to overcome the heartache of this world (All Things New, pages 16–17). » God has “planted eternity in the human heart.” This is one of the most important things you can know about yourself, because it explains your anger, addictions, longing for justice, and so much more. Is this a new thought for you? How does seeing your heart in this way help you navigate the world? » What are some specific ways that your heart aches for the restoration of all things? “I will make peace your governor and well-being your ruler. No longer will violence be heard in your land, nor ruin or destruction within your borders, but you will call your walls Salvation and your gates Praise. and your moon will wane no more; the Lord will be your everlasting light, and your days of sorrow will end. — Isaiah 60:5, Isaiah 60:17–20. . . .
“See, I will create new heavens and a new earth. The former things will not be remembered, nor will they come to mind. But be glad and rejoice forever in what I will create, for I will create Jerusalem to be a delight and its people a joy. I will rejoice over Jerusalem and take delight in my people; the sound of weeping and of crying will be heard in it no more” (Isaiah 65:17–19) (All Things New, pages 21–23). » What phrase or verse from the above passages in Isaiah resonates most with you? Why? » Imagine what it will be like when there is no more weeping and crying (see Isaiah 65:19). What does this promise hold for your life? Continue this study in the All Things New Study Guide. Come share your thoughts with us about All Things New on our blog!